The invocation and extension of the right to freedom of expression by our politicians and civil society activists in criticising judges and judicial officers has caused greater controversy after the lapse of the 2016 Presidential Election Petition. Two civil society activists, having made comments about the Judges of the Supreme Court of Zambia, have been called to explain themselves (a matter I will not dwell upon as it is active before the Supreme Court itself). Following the publication of an article by one Sunday Chanda, Media Director of Zambia’s governing Patriotic Front in which Mr. Chanda made a number of comments criticising the decision of one of our Magistrates, Mr. Exnorbit Zulu to order the trial of Dr. Simon Miti who is the Principle Private Secretary to the President of the Republic, 7 civil society organisations have seized an opportunity to raise an issue with the Judiciary. The 7 civil society organisations are now up in arms, calling upon the Chief Justice to consider the prosecution of Mr. Chanda for what they allege to be contempt of court. In this article, I advance my opinion that in a democratic and free society, such as Zambia, people are entitled to criticise the conduct of the courts or of a judge although different standards apply when you are talking about cases that are before the courts or disposed of by the courts. The question is, are there any limits to what politicians and activists can legally say about our judges and judicial officers in Zambia? (1) Except with his own consent, no person shall be hindered in the enjoyment of his freedom of expression, that is to say, freedom to hold opinions without interference, freedom to receive ideas and information without interference, freedom to impart and communicate ideas and information without interference, whether the communication be to the public generally or to any person or class of persons, and freedom from interference with his correspondence. As is the case in many other countries, it is a criminal offence to attack serving judges and judicial officers in Zambia. Politicians and activists who comment on active court proceedings may face criminal charges for subjudice contempt if there is a real risk that the person’s comments may prejudice a fair trial. Similarly, people who criticise judges or judicial officers in an abusive or unfair way (as determined by the court itself) may also face criminal prosecution for the offence of scandalising the court. The offence of scandalising the court has been criticised as unmerited and has been abolished in the United Kingdom, but remains part of our laws in Zambia. During a number of media briefings at his residence in New Kasama, Zambia’s main opposition leader, Hakainde Hichilema who was a losing candidate in the 2016 presidential election and the petitioner, along with his Vice Presidential running mate, Mr. Geoffrey Bwalya Mwamba, has come out to nakedly state that some judges of the Constitutional Court who voted to throw out his petition had received money from State House to throw out his petition, thus compromising their positions on the Court. “These days I do not even beat about the bush, Judge Anne Mwewa Sitali is corrupt, Palan Mulonda corrupt, Mungeni Mulenga also corrupt. That is why we are saying dissolve the Constitutional Court… They got 30 pieces of silver. You cannot throw out a petition before you hear it. They are agents of evil, the three musketeers,” said Hichilema while heaping praise on Madam Justice Margaret Munalula and Madam Justice Hildah Chibomba, the President of the Court, the two judges who issued dissenting opinions in the matter. In September 2017, while on a visit to South Africa, Mr. Hichilema accused the judiciary of corruption and of being under the control of Republican President Edgar Lungu. Mr Hichilema, in the company of South Africa’s Democratic Alliance leader Mr. Mmusi Maimane, alleged that the Zambian Judiciary was controlled by the Executive and also made reference to some of his party members who were acquitted by the courts of law. In the case of Bishop John Mambo, the Court has summoned him to explain why he must not be cited for contempt when he wrote a letter to the Chief Justice in relation to Appeal No. 37 of 2017 between Savenda Management Services Ltd v. Stanbic Bank Zambia Ltd. In the letter to the Chief Justice, Mr. Mambo wrote, in part stating: “the legal suit against the Bank by Savenda, though given a favourable judicial decision in the lower court, was suspiciously overturned by the higher court on appeal… Most of the judges seem to be more interested in achieving personal ambitions at the expense of justice for all and equality before the law…” Similarly, in another case, another Zambian national, Mr. Gregory Chifire has been cited with 4 counts for various media statements and the letter written to the Chief Justice in an almost similar manner. This matter cannot be discussed here because it is an active matter before the Supreme Court. “While we, as CSOs, have always been of the view that once a case is disposed of, it is no longer subjudice and therefore those who comment on it are not in contempt of court, we are convinced that the direction the highest court of the land has taken in the Savenda Management Services vs Stanbic Bank Limited case must be seen to be applied fairly, until clarity of what constitutes contempt of court is achieved,” wrote Laura Miti. The Zambian law, a remnant of English law, allows anyone to comment on judges and court decisions, but there are limits. The law relating to contempt of court developed in order to protect the judiciary and judicial proceedings from actions or words which would impede or adversely affect the administration of justice, or ‘tends to obstruct, prejudice or abuse the administration of justice’. In Zambia, contempt of court is governed by provisions of the White Book known as Rules of the Supreme Court, 1965 (1999 Edition), Volume 1. Two principal forms of criminal contempt exist in Zambia: (i) Subjudice contempt also known as contempt in the face of the court which is known to Ms. Laura Miti and her co-applicants in the case cited, and her group of CSOs, and (ii) scandalising the court, which may not be as well known or as well-understood by the 7 CSOs. Every politician, activist or media person must take keen interest to know these forms of contempt lest they find themselves wanting and unable to defend themselves. The offence of subjudice contempt may be committed when someone says or publishes something about a matter currently before the court which runs a real risk of interfering with those proceedings. This is contempt in the face of the court. Order 52/1/20 of the White Book gives examples of this type of contempt as including assaulting or insulting the presiding judge. A demonstration which interrupts proceedings, or insulting behaviour, or refusal of a witness to answer questions or give evidence, or comply with a court order to disclose information may amount to contempt. Publications which create a substantial risk that the course of justice in proceedings that are active will be impeded or prejudiced. The mischief is the risk of prejudice to a fair trial. In commencing proceedings under this form of contempt, “the Court requires to be satisfied that the proceedings are genuine and that risk of prejudice is real.” It is a defence to show that the publisher of offending material, having taken all reasonable care, did not know and had no reason to believe that proceedings were active. Publication of matters which the law or the Court has decided should be kept confidential in the interests of justice. Under the existing law in Zambia, it is also contempt of court when one does an act calculated to prejudice the due course of justice (Order 52/1/23), whether such acts are committed before, during or after the proceedings. So, interference with advocates, parties, witnesses, intimidation of judges and judicial officers in or immediately outside the Court also constitutes contempt and may be dealt with by the judge summarily and on his own motion. Statements to the effect that the accused in a criminal case will not get a fair trial are a contempt but libellous or misleading criticisms on the conduct of a Judge (or magistrate), after the trial, are not necessarily contempt. The English, Indian and our own Courts in Zambia have recognised that there is a delicate balance between the right to criticise the courts and judges and the need to protect the public’s confidence in the system. So, people are free to be critical of the courts, if their comments are made in good faith. The offence of scandalising the court fell out of use in the United Kingdom from the 1930s, and was abolished in 2013. Sunday Chanda’s article, which I have read over and over again, amounts to criticism of the magistrate in calling for the prosecution of a State Witness who was not an accused before Court and offers a fair comment on who has the right to decide persons to be prosecuted in criminal matters. To borrow from an Indian contempt of court case in Jammu & Kashmir where a subordinate court had, suo motu, initiated contempt proceedings against the heads of Transparency International (India) and the Centre for Media Studies—the two organisations had jointly carried out a survey on judicial corruption which showed that the judiciary was widely perceived to be corrupt by the public, the Indian Supreme Court observed that data that exposes any lacunae of the judicial system is not tantamount to contempt and is a welcome step forward in self-rectification. The law applicable in Zambia, allows anyone to comment on judges and court decisions, but there are limits. There is nothing unlawful about criticising the judge or magistrate as did Mr. Sunday Chanda but, of course, that can be affected by the circumstances whereby if your criticism had some particular sort of effects, then you can be prosecuted for contempt. You may criticise the decision of any court in Zambia as did Mr. Chanda and not be cited for contempt but you may be called to account when you call a Judge or magistrate corrupt or issue personal scurrilous abuse of a Judge. Is it right for civil society organisations, defenders of people’s rights to freedom of expression, to call for Mr. Sunday Chanda’s views to be investigated while, at the same time, could have turned a deaf ear and a blind eye to Mr. Hakainde Hichilema’s views as cited above? Ms. Laura Miti and her colleagues from 7 CSOs should remember the words of Voltaire, “I disapprove of what you say, but I will defend to the death your right to say it.” The debate around the call by Magistrate Zulu to call for Mr. Miti to stand trial is a healthy debate that exposes the lacunae in the judicial system and is not tantamount to contempt but should be welcomed as a step forward in self-rectification. It is my humble view that Sunday Chanda’s case may not attract any further investigation, let alone the charge of contempt of court. I will not comment on the cases of Bishop John Mambo or Mr. Gregory Chifire who is my good friend because the matter is now before court and I am better off holding my peace. Why betting online with betPawa can win you more in Zambia? This guy is real asset to Zambia’s legal fraternity. Wish we had more of him who could educate Zambians on these hot legal topics. This guy sits on PF legal committee, and is one of strategists within PF News Diggers been talking about. The critism of the judiciary is as a result of something that the public is perceiving about the judgements lately. The issue of boma ni boma has created an impression that those incharge of GRZ and their supporters will not suffer consequences of the actions from any Government authority. Respect for the judiciary and judges should begin with those in power by obeying court orders and stop threatening judges whenever they rule against their own cadre s and surrogates. The culture of a Nation is shaped by its leaders. Change must state at the top of GRZ for respect to the judiciary to be restored, one will respect the judiciary that their leadership doesn’t. Correction: The culture of a Nation is shaped by its leaders. Change must start at the top of GRZ for respect to the judiciary to be restored, no one will respect the judiciary that their leadership doesn’t. All the above comments are Sunday Chanda. Same idyot changing names. Our sources tell us State House Presidential Aide for Legal Affairs is one who wrote this with Kaiser Zulu. I got lazy and couldn’t read the story. Too long. Will read later. Fact is that Laura Miti suggests Supreme Court is applying selective justice could also be construed as contempt of court. The woman is attempting to bring the name of the supreme court into ridicule and contempt. Nice article this one!!! Wow! Beautiful article. Easy to read and understand. Now, Mr. Chanda needs to tame his tongue also. But tell me why HH was not cited for contempt. A lot of sense and education in this article. But what has happened to our NGOs in Zambia that people like Laura has thrown out good reasoning to wanting people they don’t agree with behind bars for exercising their right to free speech? That’s what happen when donor money takes over reasoning. Totally and absolutely right! Where is Laura and her theories? I hope she can see that despite is the practical interpretation of the law on contempt of court. Bishop Mambo may have committed contempt because of the choice of his words. How can you say the Supreme Court suspiciously overturned the decision of the lower court? what is suspicious about the higher court overturning decision of lower court. On the other hand, how can you want a citizen who criticise the magistrate ruling in good faith to be sited for contempt? dull thinking Laura. It won’t save Bishop Mambo. just let him demonstrate how suspicious the overturning was or the clear the mud he threw on supreme court judges that they are concerned with personal ambitions. Mwanawasa criticised Supreme Court in the Mabenga case; George Kunda criticised the Supreme Court too and defended Mabenga. These were lawyers. CSOs criticised Magistrate Chinyama when acquitted FTJ; Sata criticised the courts. 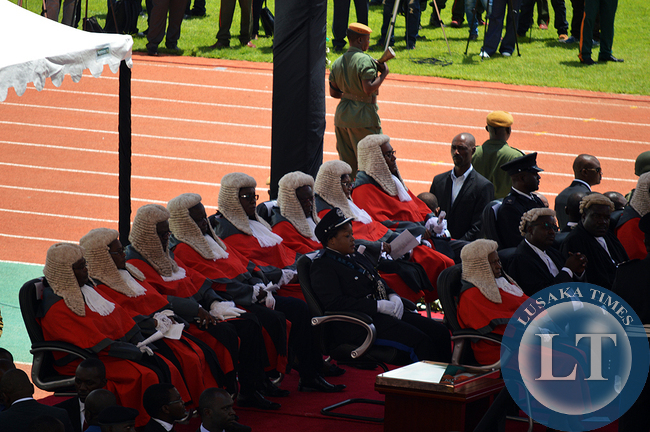 Lungu criticised ConCourt Judges; HH called Judges corrupt. So whats big deal? What’s the obsession of this PF cadre with Mr. Hichilema. Why can’t you leave him out in your discussion and defense of Jonathan Mutaware and cronies? Just come out publicly and tell nation you the front of the PF Legal team. We know this for a fact. First time in my life, am beginning to understand what contempt of court in Zambia is. why is LAZ not providing this public education? Our Comrade has not done justice by standing with politicians instead of defending his own. That is how CSO has been destroyed. The write up is good but cannot be good enough without reference to the cases that invoked the civil society to write to the CJ. IN SWAZILAND, JUDGE MPENDULO SIMELANE OF THE MBABANE HIGH COURT DETAINED THULANI MASEKO, A PROMINENT HUMAN RIGHTS LAWYER, AND BHEKI MAKHUBU, THE EDITOR OF THE NATION MAGAZINE, FOR CRITICISING JUDGES, UNFAIRLY IN 2014. PEOPLE MUST BE CAREFUL. EVEN LAURA MITI HERSELF DESERVES TO BE CITED FOR CONTEMPT BECAUSE SHE WANTS TO USE THE SUNDAY CHANDA CRITICISM TO INFLUENCE THE DECISION OF THE SUPREME COURT. LAURA’S MOUTH ISN’T SO MUCH AN ASSET TO THE COUNTRY, IT MAY BE AN ASSET TO NEWS REPORTERS BUT NOT ORDINARY ZAMBIANS. ISAAC MWANZA IS KNOWN PF STRATEGISTS. HE KNOWS HOW TO CLEAN THE MESS UP FOR HIS PARTY. WAIT UNTIL UPND IS IN POWER 2021, WE SHALL CHASE CORRUPT JUDGES AND JAIL EVERYONE INCLUDING MWANZA. Two institutions in Zambia that have completely lost their moral standing are the Police and Judiciary. If any opposition party assumes power,they will need to spend the first term just cleaning up things. The Zambian Police and Judiciary are rotten to the core. “However there are a few flies in the oil and of late there has been a sordid whiff emanating from some quarters of the judiciary that is nauseating the air and space of justice. With due respect, by any standard quoted by Isaac Mwanza, these words amounts to contempt of court. So the words may amount to libel or misleading criticism but that does not amount to contempt, in my view. Also these words are contemptious in my view: “When has a judge ever directed who and should not be prosecuted? The courts can order the arrest and prosecution of persons on own motions e.g. in contempt proceedings. So what is the fuss about? @Monde 22.3 please enlighten me: is DPP prosecuting Bishop Mambo and Cifire with respect to the contempt case on going before the Supreme Court? I’ll need to read again before I make a comment. Right now I am at a bar counter with too much noise. Why can’t ZNBC or any TV station run a program to educate us people on these legal issues, including live coverage of court discussions? Masterpiece! But I ask, where was this information all along when fellow citizens been asked to exculpate themselves from contempt? Where was this Mwanza lawyer? I agree Edgar uses these guys to clean the mess and that is how politically intelligent he is. Look at our SG, Who fails to find candidate in Kasenengwa even on 11th hour? You may only criticize if you are from the ruling party. All others need to be cited for contempt. Very few legal scholars have broken down this topic in Zambia for an ordinary man like me to understand it. I don’t even think HH even the understood the gravity of what he had been saying. Sunday, Bishop Mambo, Chifire, and Laura, like HH ought to be punished for insulting the integrity of the courts.